I was raised by a mother who loved movies. In a blog written for the 68th Carnival of Genealogy as a tribute to women, I wrote that my mother spent all her money on movies and concerts. She told me she saw every movie as well as every opera singer that came to Oklahoma City. With very little education, mother spoke impeccable English, sang hundreds of songs and arias learned completely by hearing them in movies and on recordings or the radio and she had a personal style of elegance learned mostly from watching movies. As a small child, mother introduced me to her love affair with movies by taking me to see such early Disney feature-length cartoons as Snow White and the Seven Dwarfs, Pinocchio, Bambi and Song of the South. Like my mother, I learned the songs from those movies. Mother bought me the 1950’s album of Snow White. My brother, Mickey, talked about listening to that album, narrated by Dennis Day, on our record player (he’s six years younger than me and hadn’t seen the movie at that time). I still have the record though the front of the album cover is gone as well as the 24-page color booklet that came with it. I loved that album and listened to it for perhaps 15-20 years – the records are almost slick. I particularly enjoyed I’m Wishing [Snow White’s duet/echo from the wishing well] and One Song, Someday My Prince Will Come, Whistle While You Work, and Heigh Ho, It’s Off to Work We Go. I have to say, some of those Disney songs shaped my positive outlook on life and my work ethic, including these from Snow White, but also tunes like Zip-a-Dee-Doo-Dah from Song of the South. Saturday afternoon at the movies. By the time I was about ten, I lived in a neighborhood where all the kids went to the movies every Saturday. 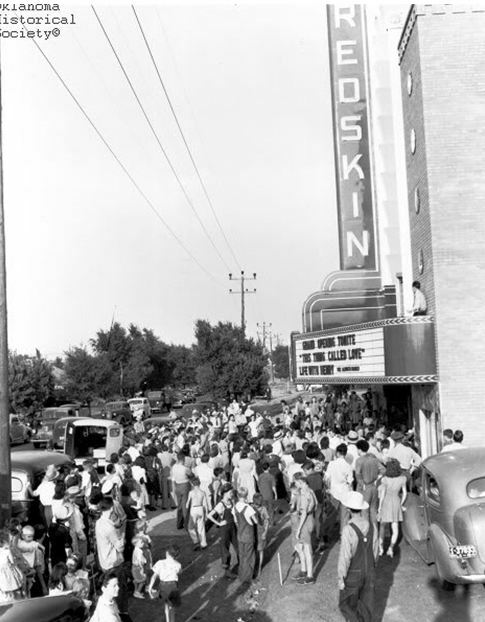 We would walk over to the Redskin Theater at SW 29th and Western to be with other friends and watch a double feature movie. Most of those Saturday movies were westerns or comedies so I saw the Bowery Boys movies, Roy Rogers, Gene Autry, Tim Holt, Hopalong Cassidy, Tarzan, and Bud Abbott and Lou Costello. There were also shorts with the Three Stooges and Our Gang comedies as well as cartoons, such as Mr. Magoo and The Road Runner as well as Mickey Mouse, Donald Duck, or Bugs Bunny, Tweety Bird, and Elmer Fudd as well as the other Disney or Warner Brothers cartoon characters. My favorite actor when I was ten to twelve was Tim Holt, though I also liked Richard Green, and my favorite actress was Yvonne DeCarlo whom I thought was beautiful. Every Saturday was a great day. The theaters were filled with kids and we were there from about noon to 5:00. I would have enough money to buy a drink and a candy bar (probably a quarter) and, due to the length of time I was in the theater, it needed to be something that would last a long time, so my favorites were the chewy Milk Duds, Bit-O-Honey and Tootsie Rolls. My other favorite, Milky Way, didn’t last long enough so was rarely my Saturday afternoon choice. A movie I particularly remember was Samson and Delilah. Although it came out in 1949, I don’t think I saw it as a first-run movie. I would guess I was in junior high, maybe 1952 or 1953, when it was shown at the Capitol Theater at 2510 S Robinson, which was only two to three blocks from our house [Doug Dawgz blog has loads of great pictures and post cards from earlier years and I’ve included both an exterior and an interior photo from his website taken in the 1930s when it was still the Circle Theater]. I loved that movie – Hedy Lamarr was absolutely gorgeous as the sensuous [I doubt I had a real clue as to what th at might mean] Delilah but I also thought Angela Lansbury was beautiful in a more pure way. I still remember my feelings as I watched it – feelings of loss as Angela Lansbury’s character was killed, and feelings of confused amazement that Samson would alter everything he believed in just to be with Delilah and my wonder over the loss of his power as well as the return of his strength in order to bring down the Philistine’s idol. 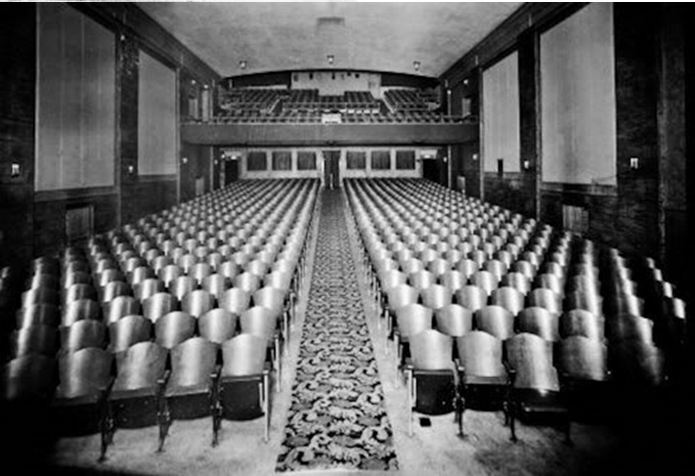 I even remember where I sat in the theater; I sat on the left side of the theater (right side of photo) about 1/3 of the way back. I associate movies with my mother and never with my father, but as I watched an old movie on television that starred Ann Sheridan, I remembered him telling me she was his favorite actress, which implies he went to movies, at least in the 30s and perhaps early 40s. Although I don’t remember ever going to a movie as a family, I also don’t remember going with mother either, even though she told me she took me to see any number of the movies I mentioned earlier. I remember the emotional aspects of seeing Bambi –my tears when Bambi’s mother died – and the cuteness of Bambi trying to get up and walk as a new born, and even the joyfulness of Thumper and Bambi’s friendship ~ just nothing about the theater or mother’s presence. I also have no memories of Snow White other than those that could easily be connected to the record and accompanying picture book, even though, once again, mother told me she took me to see it. Pinocchio is another one I saw when it came out and I have some recollections of watching it – particularly my sense of impending danger when those boys lured Pinocchio into doing something he knew not to do – but those recollections could just as easily be recollections of seeing it at a later time – on TV perhaps. Each of those movies I mentioned was originally made either before I was born or when I was much too young to have watched a movie, so clearly mother took me to see them at a time of re-release. Song of the South is probably the first movie I saw as a first run movie – it came out in 1946, though again my recollection doesn’t include any remembrance of mother’s presence or a theater. Song of the South was a wonderful movie that has been pulled in the United States with no intention of it ever being seen again due to some people’s interpretation that blacks were not being shown in a positive light or that some positive aspects of slavery could be inferred [it is available in some other countries but I think the formats require some sort of conversion to work on our machines]. The Br’er Rabbit stories were a collection of African-American folklore compiled by Joel Chandler Harris and were depicted in both the book and the movie as being told by an old former male slave known as Uncle Remus to the white children in the southern family that had owned him prior to the Civil War. Hiding those movies does not negate the fact that slavery was a real aspect of American history, that the stories were delightful, and that Disney’s movie version was fabulous and, in my opinion, its lack of availability is a great loss to both adult’s and children’s viewing pleasure, regardless of ethnicity. By the time I was a teenager, besides ‘cruising Main,’ the other thing to do on date nights was go to a movie. On my first date, I went to see Not As A Stranger at the Centre Theater in downtown Oklahoma City. Although that theater is no longer in existence, I believe at least portions of the building were incorporated into the current Museum of Art that houses both permanent and rotating art collections as well as a large Chihuly glass collection. In the mid-1950s, cities had not yet begun their urban sprawl and downtown areas were still places where people got dressed up to go shopping as well as for a special night at the movies. 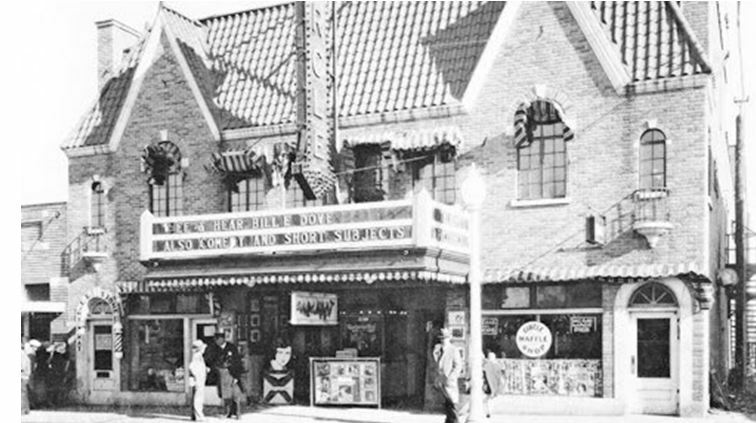 Movie premieres were a big event and I remember seeing a midnight preview of Good Morning, Miss Dove at the Criterion and seeing Oklahoma!, which had to be seen at the State Theater because it was the only theater equipped for showing a movie using the new Todd-AO. One of my choir director’s favorite musicals was Carousel, and at his recommendation I went to see that movie when it came out. There were, of course, the mostly teenage interest movies and I saw most if not all of them. That included Elvis Presley movies made prior to my marriage, Blackboard Jungle and Rebel Without a Cause. Another popular form of movie viewing in the 1950s, at least in reasonable weather, was the drive-in movie and I had my fair share of drive-in movie dates as well as whole groups packed into cars and meeting up at the drive-in. Although many of the movies I saw at drive-ins were B movies, I also saw The Ten Commandments at a drive-in. As much as I was raised on movies and truly enjoy them, after my marriage, a night at the movies was a special treat – although a movie with special appeal to the interests of my husband was generally an exception. We saw 2001: A Space Odyssey at a premier in Hollywood while we were living in Long Beach. We also saw Star Wars, and Superman. We went to see Airplane!, which was a great disappointment at the time because it was a comedy and airplanes were a serious interest to my husband – I have since come to appreciate its humor. Other movies I managed to see in the theater during my marriage included The Sound of Music and Funny Girl, as well as taking our daughter to see Jungle Book. Currently, I have a small group of female friends that occasionally get together for a movie and I remain ready to go whenever an opportunity presents itself. Otherwise, I wait to see it on television since, for me, a movie in a theater should be a shared experience.